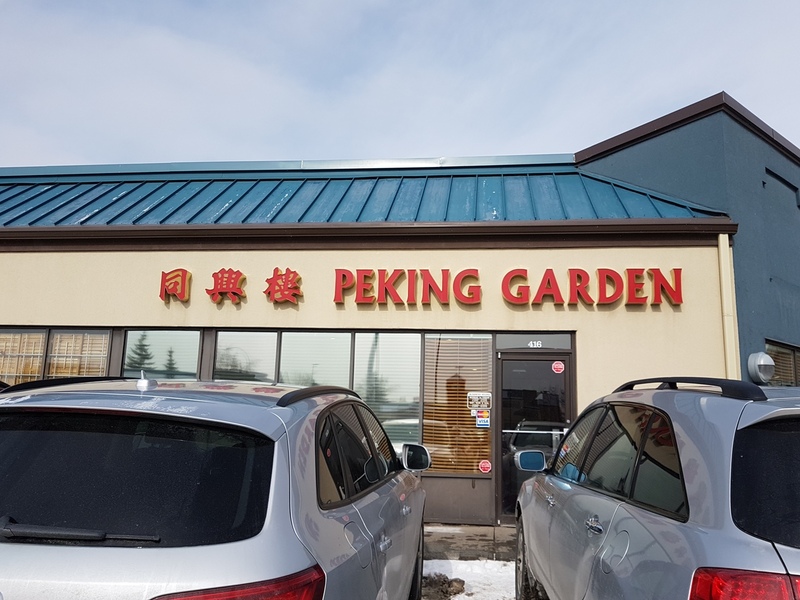 This is interesting, as I’m not too sure how we ended up at Peking Garden for lunch one afternoon. We’re rarely in the area and would rarely go for Chinese food if I was in the car stating I was hungry! We also had to wait a good 20 minutes for a table, which I wouldn’t have done if I was that hungry! The place was packed and there was a constant order of take outs. We did get seated and the service didn’t see slow or rushed! 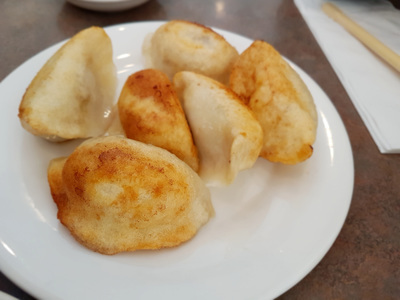 One of my favourite dishes to order are Dumplings as all my coworkers claim I make the best dumplings ever. I always want to find a comparable place to try to trick them… but they’re kind of right, I do make a great dumpling! Here, they make a good one as well, with skins a bit thicker than my own, but the filling is tasty and not dry. I appreciate a well seasoned dumpling then if the skin is thick, I wouldn’t mind. Just like the ones here! 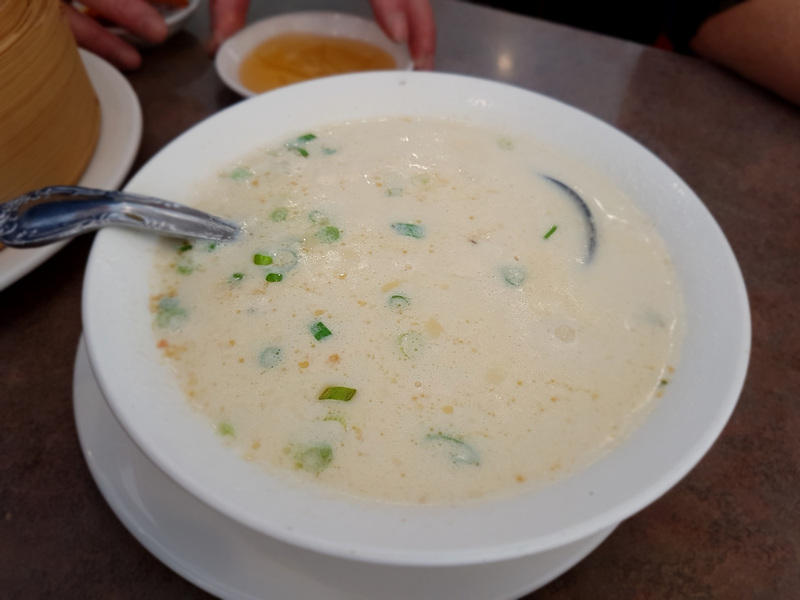 My inlaws use to take me to eat Salty Soy Milk or some call it savoury soy milk. It’s not something I was familiar with until they brought me to experience this and now I love the uniqueness of it. They had it when we went to Shanghai a few years ago and I’d get it when I can. Both sweet and savoury. 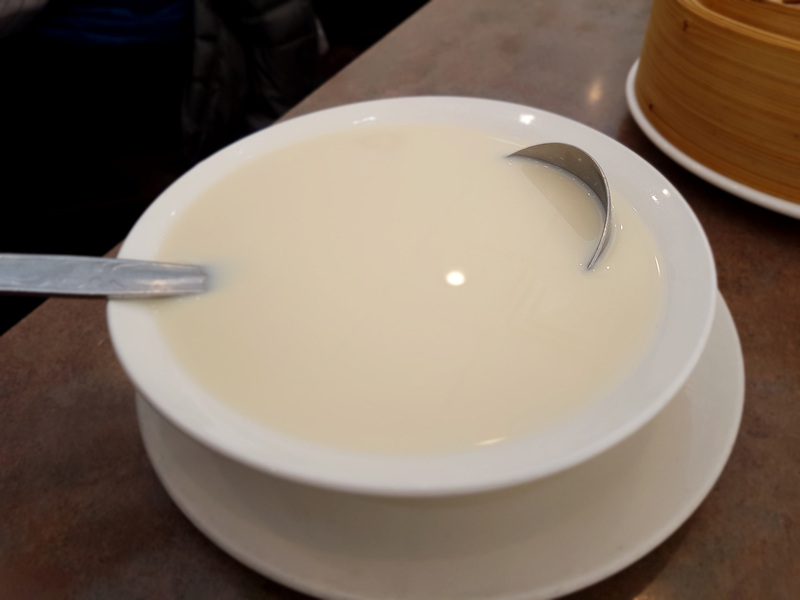 Because I’m a huge fan of sweets, of course I needed to try their Sweet Soy Milk as well. Yes, we did order too much of this stuff!! LOL! But, surprisingly we finished it all!! One was more like a drink (the sweet one) and one ate like a soup! So, we separated the two and finished it. Then, when we were in Shanghai, we ate TONS of Xiao Long Bao, and when I saw this on the menu, naturally I would order it as well. Haha, this lunch does get bigger as well… sadly. 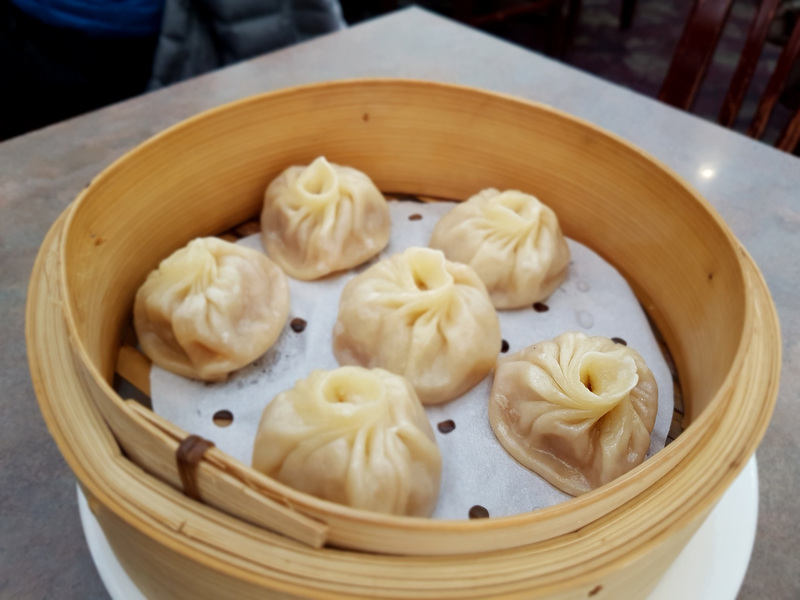 But, it was really well made xiao long bao’s, steamed nicely and it did have the soup inside the dumplings still! It’s not easy to make it like this, but they got it! Alright, your little pig friend finally stopped ordering food. After the order of Sticky Rice. I loved zha choy, and sticky rice, and fried donut… and stick them together, I LOVE IT! 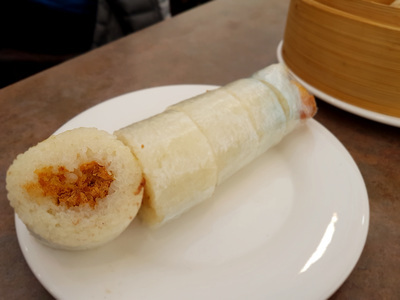 So, yes, I ordered some Sticky Rice and it wasn’t as exciting as I’d hope. I was just glad to have some though as there’s really not many places that would make this for you, unless you come to my house, or T&T supermarket. So, just come to my house for my homemade soy milk, dumplings, xiao long bao and sticky rice! I don’t think I’ve ever made a meal JUST this for anyone yet. 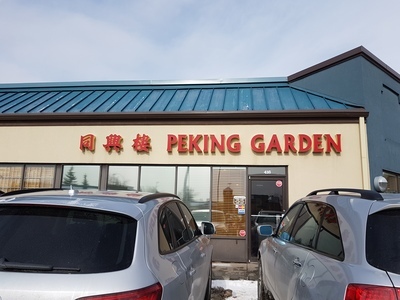 Anyway, just rewriting my adventure here at Peking Garden stuffs my belly and makes me proud of what I’ve accomplished at home in my own kitchen. 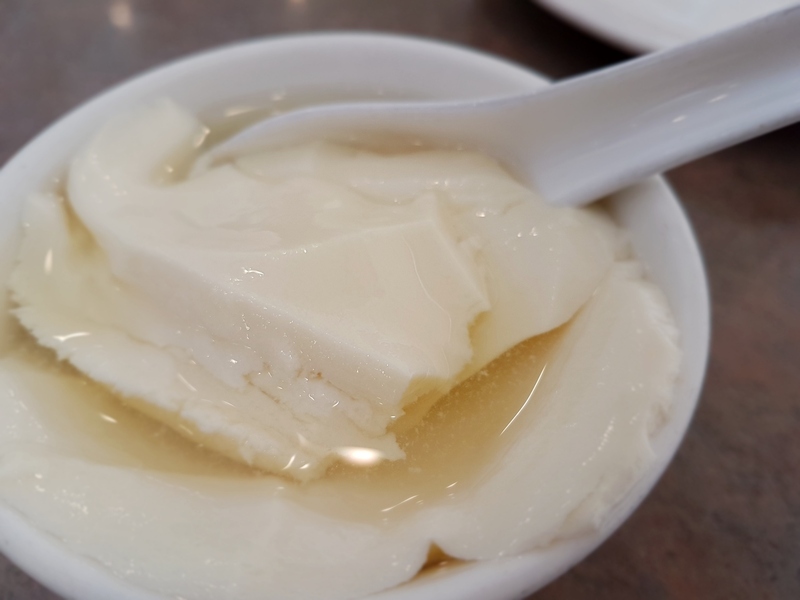 It was a great time here and to top it off, they give me Tofu Dessert! This place is wonderful! So, all and all, this place is fabulous! We wanted a hot and spicy dinner on a cold wintery night and decided to go towards Mahogany and see what food outlets has opened in that area. We stumbled into Green Chilli Grill just off of 52nd Street. There are tons on parking in the parking lot, but there’s also lots of food options in the area so I can see it being busy especially during hot summers nights. We went in and got seated right away. It wasn’t too busy, but there were tons of take away orders as we constantly saw people come in and grab food and leave (both delivery services and personal pickups)! So, it was a promising sign. I started with a nice hot Masala Chai which came in an individual pot and it was well spiced. It wasn’t as creamy and rich to my liking but I did enjoy it thoroughly! Right away, they brought out the Papadum which was really nice! It didn’t have a burnt taste to it or anything. The sauce was really tasty as well! It was like a spicy plum sauce or some remake of it! We decided to order 2 curry dishes with the sides to carry the curry and soak up the sauces. we decided to both pick a dish and I decided I wanted the Mango Chicken, where it had a generous portion of chicken in a sweet sauce. I normally don’t pick dishes with white meat, but I decided to go for this as they cooked in cashew based sauce with cream, butter and mango pulp. The other curry dish we had was more “typical” and was their Chicken Tikka Masala, also with chicken as the name suggests, but cooked in a sauce that’s both creamy and delicious. It wasn’t too spicy but it was just right. The waiter did ask us for our spice level and we said medium. So, it was perfect. Along with the curries, I love eating Garlic Naan so we had an order of that. I love scooping up the curry as it saturates itself in the rich sauce. I believe it’s the perfect vehicle to eating my East Indian curries.. but, my other half likes to be different! To satisfy him, we also had an order of coconut rice. He likes that the curry sauce gets absorbed into each grain of rice and swells up in flavour. I do like it as well, I can’t lie! Overall, we had a fantastic time here and it’s nice to have another East Indian option that isn’t too far from home. 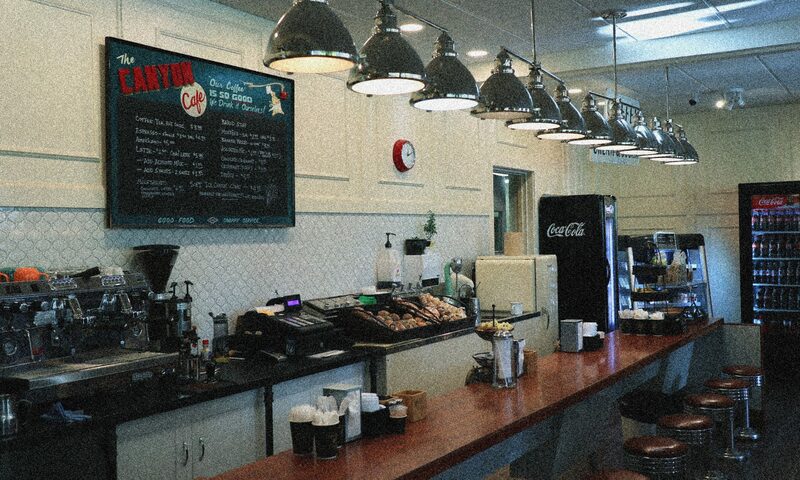 The service was great, the food was excellent and the prices was fair! There’s no complaints at all. I know we’ll be back in the future! We were at work and wanted something unique for lunch. All the places that delivered didn’t do it to our area, including Tuk Tuk Thai which she was really craving. So, we decided to hit this place up after work. We lucked out that we got a parking spot pretty close to the front of the restaurant and the place wasn’t busy. It was a simple menu with fantastic service and great explanation of the menu and food. I decided to try their Cashew Chicken which was a generous portion of crispy chicken, greens, carrots and cashews with sweet & sour chili sauce all over rice. The presentation was extremely beautiful and it opens into a beautiful plate. The food was phenomenal as well. I also ordered their Thai iced tea, and that was pretty amazing as well. It was a well flavoured tea that wasn’t too sweet or too strong. It was actually just right. We also had an order of Pad Thai which they had a huge portion of rice noodles, with chicken and pad thai sauce. The portions were extremely generous again and the food was hot and tasty. Overall, it was an extremely enjoyable experience here, with great view outside, great food, and great company. I can imagine this place being crazy busy on a summers night, or a day where everyone just wants to do take out as there’s lot of residential buildings around. I really enjoyed the Thai food from here!